In Artifictional Intelligence, Professor Harry Collins warns that humans are in danger from artificial intelligence. The danger is not enslavement by super-intelligent computers but surrendering control of everyday life to stupid ones – such as those empowered to validate airline tickets (which refused to recognise ‘Harry’ and ‘Harold’ Collins as the same person). Collins’s core argument is that until AI can use language with human flexibility it will never embed itself into human culture. And since current deep-learning technologies are not designed to achieve this linguistic flex]ibility, AI will not exceed human intelligence by 2045 (as predicted by Collins’s chosen foil, Ray Kurzweil). Criticisms of Kurzweil’s views are nothing new. But Collins’s sociological perspective does offer a novel counterpoint to the views of those IT scientists who argue, in essence, that once a computer can count beans fast enough it will acquire consciousness and AGI. 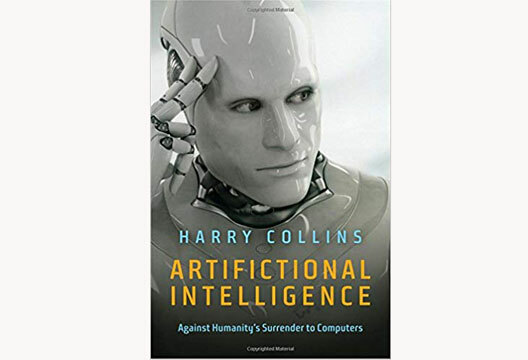 Disappointingly, except perhaps for sociologists, Collins matches Kurzweil’s hubris about AI with his own parochial view that all human elements in the AI debate can be articulated with sociological concepts alone. With his reasoning thus straitjacketed, Collins excludes from his analysis – for example – the qualitative nature of organic intelligence, its complex evolutionary variations and the functional relationship between intelligent behaviour, learning mechanisms, motivation and adaptive success. ‘Intelligence’ does not even make it into the index. Artifictional Intelligence argues persuasively that human-like AI is distant. But by applying sociology in isolation, Collins slides into the misleading anthropomorphisms that he, rightly, warns against. It is meaningless to talk of computers as being ‘stupid’ or intelligent; computers don’t care. They simply present human-devised rules (rejecting ‘Harry’ Collins’s Easy-Ryan ticket and compelling a systolic ‘Harold’ Collins to buy a new one). And this, surely, encapsulates the actual danger that societies face from computer technologies: not stupidity or brilliance, but the vastly increased power they give to people in large organisations to facelessly rule our lives.